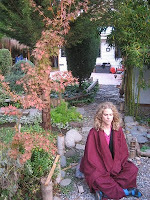 OSHO bytes: "The Earth Was Shaking, We Were Meditating." Believe it or not, this is what Osho meditators have reported from Chile. On February 28th the terrible earthquake that shook Chile was 700 times stronger than that of the Haiti earthquake. Now everybody knows that Chile is quake- prone but every new earthquake shatters and devastates the citizens anew. What can one do in this situation? Nothing can be done outwardly for sure, but much can be done inwardly. And that's what the Osho meditators in Chile do. There are four Osho Meditation Centers in Chile , so when we heard about the terrible earthquake we sent worried emails to them asking about their welfare. One of the center co-ordinators Aseema wrote : "The earth keeps shaking and thanks to Osho... we run in! " Easier said than done. Right? But these guys are saying this in the midst of the destruction all around. This is the strength of meditation. This reminds me of a story Osho tells; it's about a Zen master whose unique behavior in face of death is a great learning for all.
" It happened that a Zen master was invited as a guest. A few friends had gathered and they were eating and talking when suddenly there was an earthquake. The building that they were sitting in was a seven storey building and they were on the seventh storey, so life was in danger. Everybody tried to escape. The host, running by, looked to see what had happened to the master. He was there with not even a ripple of anxiety on his face. With closed eyes he was sitting on his chair as he had been sitting before. a guest was sitting there and the host was running away. The others, the other twenty guests, had already gone down the stairs but he stopped himself although he was trembling with fear, and he sat down by the side of the master. The earthquake came and went, the master opened the eyes and started his conversation which because of the earthquake he had had to stop. He continued again at exactly the same sentence -- as if the earthquake had not happened at all. The host was now in no mood to listen, he was in no mood to understand because his whole being was so troubled and he was so afraid. Even though the earthquake had gone, the fear was still there. He said: Now don't say anything because I will not be able to grasp it, I'm not myself anymore. The earthquake has disturbed me too much. But there is one question I would like to ask. All other guests had escaped, I was also on the stairs, almost running, when suddenly I remembered you. Seeing you sitting here with closed eyes, sitting so undisturbed, so unperturbed, I felt a bit of a coward -- I am the host, I should not run. So I came back and I have been sitting by your side. I would like to ask one question. We all tried to escape. What happened to you? What do you say about the earthquake? The master said: "I also escaped, but you escaped outwardly, I escaped inwardly. Your escape is useless because wherever you are going there too is an earthquake, so it is meaningless, it makes no sense. You may reach the sixth storey or the fifth or the fourth, but there too is an earthquake. I escaped to a point within me where no earthquake ever reaches, cannot reach. I entered my center."